Archer‘s mission is being cut short. FX has reduced season seven of the animated series down to 10 episodes. The comedy centers on the adventures of former master spy Sterling Archer (H. Jon Benjamin), who now works as a private investigator. Aisha Tyler, Jessica Walter, Chris Parnell, Judy Greer, Amber Nash, Lucky Yates, and Adam Reed also provide voices. 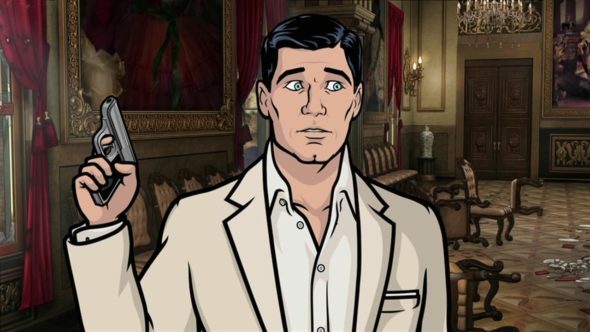 When FX renewed Archer in 2014, they ordered 13 episodes for the seventh season. However, the current schedule has only 10 episodes listed. The season seven finale airs on June 2nd at 10 p.m. ET/PT. What do you think? Do you watch Archer? Do you think season seven should’ve been longer? How have only 5 people commented on this? Archer can’t be canceled! It makes Family Guy look like Fox News. This is the only show worth watching on FX. Why would you drop it down to 10 episodes? I feel like it just abruptly ended mid season. Not a well thought out move. Please, name one show on your network that is worth watching besides Archer? As usual FX screws up again best show ever on the pathetic network n they shorten it and maybe not renew all the more reason to ask cable providers to drop this worthless network ran by idiots!!!! !